Skincare, hair care, make-up, perfumes, toiletries and deodorants, and oral cosmetics are the main product categories of the cosmetic market. Since the early twentieth century, the production of cosmetics and beauty products has been controlled by a handful of multi-national corporations– L'Oréal, Unilever, Procter & Gamble Co., The Estee Lauder Companies, Shiseido Company, to name a few. In 2016, the U.S. was considered the most valuable beauty and personal care market in the world, generating approximately 84 billion U.S. dollars in revenue that year. Based on retail sales, chain beauty store Ulta Salon, Cosmetics & Fragrance was the leading health and beauty retailer in the U.S. In 2015, Ulta generated approximately 3.72 billion U.S. dollars in retail sales. However, Sephora (LVMH) was the leading health and beauty retailer in terms of sales per store. In 2015, Sephora’s sales per store reached a total of 5.1 million U.S. dollars, compared to approximately 4.3 million dollars per Ulta store. In recent years, e-commerce has played a greater role in the U.S. cosmetics industry. The share of online health and personal care sales as a percentage of total retail e-commerce sales was projected to increase from 7.8% in 2016 to 9% in 2021. As of 2016, Amazon 3P was the leading online beauty retailer, with a 21.1 percent share of the total market. Within the cosmetics category in the U.S., foundation was the most profitable segment. In 2016, about 985 million U.S. dollars were generated from sales of foundations in the U.S. Mascara was the second most profitable segment, with sales revenue of 941.5 million U.S. dollars. Mascara was also the leading segment of the eye cosmetic industry in the U.S. The segment also included eye liners, eye shadows, eyebrow makeup and eye combos. Together, these segments generated more than 2.1 billion U.S. dollars in sales revenue in 2016. Besides foundation and mascara, lipstick was also a profitable segment within the cosmetic industry in the U.S., generating 626.8 million U.S. dollars in revenue for the lip cosmetics category. 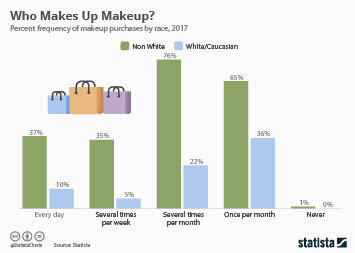 Given the size of the cosmetics market in the United States, consumers are faced with nearly unlimited options in terms of which brands to purchase, with several brands standing out as among the most popular. According to a 2016 survey, the most favorably viewed cosmetics brands in the United States were Maybelline, L’Oréal, and Cover Girl. On social media, however, the prestige brand Anastasia Beverly Hills dominated the discourse, being mentioned in 32 percent of all beauty-related social media actions. Topic: Cosmetics consumer behavior in the U.S.
More interesting topics from the industry "Cosmetics & Personal Care "